This is a book full of important essays. And of course I urge you to read the whole thing. The seven essays under “L=A=N-G=U=A=G=E.” The seventeen pieces about individual writers under the titular heading “Pitch.” The comic deadly serious epilogue under “Bent Studies,” that catalogue of recalcitrances, aphoristic chips from the workbench of a life’s work of radical anti-sectarianism, index-sourcework for what I take to be Charles Bernstein’s most significant contribution: his incessant anti-anti-intellectualism. If you can’t manage all that reading, I recommend starting with the eleven collaboratively written essays under “Echopoetics,” for there is where readers will locate the heart of this poet-critic’s intellectual generosity and aesthetic flexibility. “Echopoetics” is a poetry of call and response. Its poetic theory and its frankly affirmed values are discernible variously in these essays, talks, conversations, statements and anti-programmatic programmatic dicta. Echopoetics is pitched at you here, opaque yet direct, full of the impossibly restless curiosity that is characteristic of Bernstein as a temperament, calling modestly for the continuing modern dialogue of reason and imagination, for collaboration founded on pataquerical qualities, for “midrashic anti-nomianism”: made happily weak rather than strong by over-reading — clumsy, erroneous, freakish, foreign (in the sense historically denounced by anti-Semites), incongruous, anomalous, polyverse (borrowing from Lee Ann Brown), paracritical (borrowing especially from Jerome McGann), contradictory (borrowing from Marx and Whitman synthesized), artificial (borrowing from Oscar Wilde), degenerate (again turning around the fascist valence), bent, pidgin, nonstandard, anti-absorptive, thick, hyberbolic — feverishly pitched. “So let’s pitch in,” he says, in yet another of his silly-seeming punny pitches. He ironizes, he leans, it's not in his constitution to proselytize, but he does, at moments, unironically seek a collaborative engagement. He likes saying: You have to love originality so much, you keep on copying it. Thus monotony — such as that produced by Charles Reznikoff’s monolithic Testimony — entails a work of writing that speaks not for itself but as itself. This is a difficult but key distinction. This book makes us realize that Bernstein’s goal, ultimately, after all these years, has to discover a pitched state or situation in which he can speak as himself. When he praises Raymond Federman’s “Take It or Leave It,” by commending how such work “shows [that] digression and the comic can weave their way around an empty center without betraying it,” he is I think striving to speak about himself — inside the ideal of the engaged writing life. At left: part of the overflow audience at the Kelly Writers House on April 12, 2016. 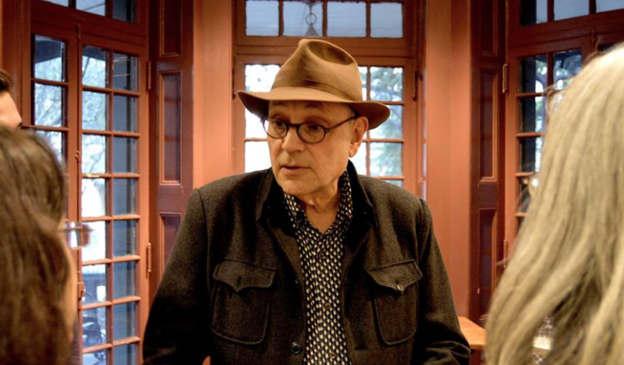 Although Charles Bernstein been called to this podium [in the Arts Café of the Kelly Writers House in Philadelphia] many times over the years, it surely has not been often enough to read from his own work. So let us welcome our dear distressed, aversive, non-standard friend Charles Bernstein.